Washington D.C. -Today the Republican House and Senate passed the Republican Tax Reform Bill, a bill that has seen unprecedented disapproval by American citizens. According to The Hill, “Public polling on the GOP’s tax overhaul indicates support hovering at less than 30 percent, which is even lower than the favorability toward ObamaCare when Democrats passed it in 2010”. In addition, every democrat from both chambers opposed the bill. The primary goal of the bill is to cut taxes, but the bill will also repeal the Affordable Care Act’s individual mandate and will open the Arctic National Wildlife Refuge (ANWR) in Northern Alaska for oil and gas drilling. Opening ANWR for oil development has been a top energy priority for Republicans and the oil industry for more than four decades, with Rep. Don Young (R-Alaska) spearheading this initiative since the 1970’s. Republicans claim that the region holds over 10.3 billion barrels of oil, however, the results from an exploratory well drilled in ANWR 30 years ago have never been released to show the presence of oil or not. While Republicans like Sen. Lisa Murkowski (R-Alaska) and Speaker Paul Ryan (R-Wis.), claim they will develop “safely” and in “non-wilderness zones”, biologists have found that it is near impossible to repair damage to this biome. In addition, it is one of the most biologically diverse places in the Arctic and Subarctic and home to many Alaskan Tribes, such as the Gwich’in, who depend on the biodiversity of this region to survive. The Gwich’in refer to this region as the “sacred place where life begins”. It is the breeding grounds for the Porcupine River caribou, which sustain the physical, spiritual, and cultural well being of the Gwich’in. 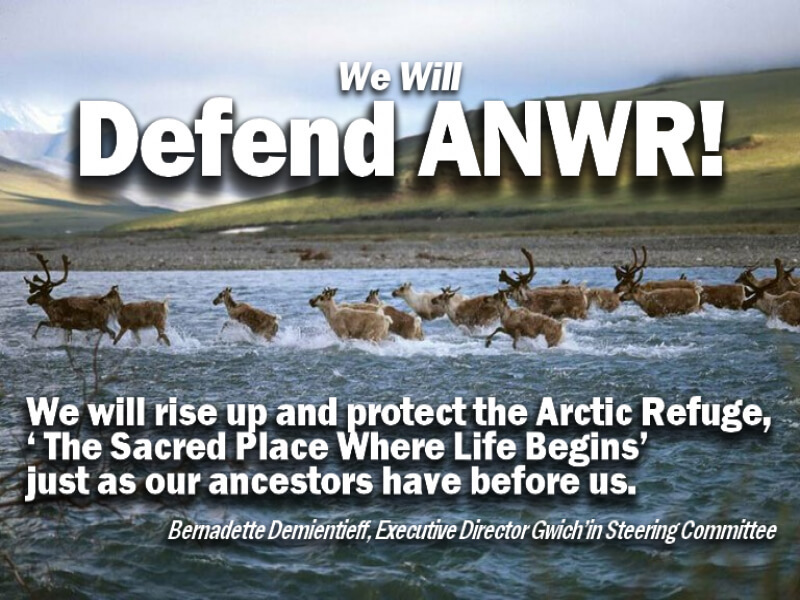 Any threat to the Porcupine River caribou is a threat to the Gwich’in. More assaults by this administration on Indigenous Rights, Free Speech, and Sacred Lands – all happened just last week!